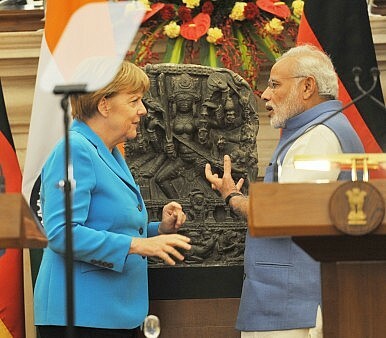 German Chancellor Angela Merkel visits India, broadening an important bilateral relationship. Notably, the two sides agreed to a special exception for Germany companies seeking entry into the the Indian market to set up operations. Under a new bilateral agreement, German firms will receive fast-track approval to enter in the Indian market, the Times of India reports. Merkel is accompanied in India by a large delegation of German business leaders. In a joint statement issued at the conclusion of Merkel’s visit on Monday, both sides outline the content of the talks and the scope of Indo-German cooperation in global affairs. Modi and Merkel affirmed both country’s common position on UN Security Council reform, picking up on the agenda of the latest G4 leaders’ meeting in New York, before the seventieth session of the UN General Assembly. Describing themselves as “strategic partners,” both sides pledge to cooperate on the world stage. On the security front, the two countries signed MoUs on aviation security, disaster management, and stated their joint commitment to continue regular meetings of their joint working group on coutner terrorism. The Hindu notes that Germany refused to sign the Mutual Legal Assistance Treaty (MLAT) with India, owing to concerns about India’s use of the death penalty. Readers of The Diplomat will be unsurprised to read that the two countries also threw their support behind “the importance of freedom of navigation in international waters, the right of passage and other maritime rights in accordance with accepted principles of international law, including the UN Convention on the Law of the Sea.” Though the agreement did not mention specific dispute areas, including the South and East China Seas, the two sides called on “all parties concerned to seek peaceful and cooperative solutions in accordance with international law and practice.” India has taken to mentioning the South China Sea dispute by name in bilateral, and more recently trilateral, agreements with partners. Interestingly, the joint statement includes a statement on the ongoing crisis in Ukraine, where Russia-backed rebels continue to fight a western-backed government. Merkel and Modi “reiterated their full support for ongoing efforts to find a diplomatic solution to the conflict in eastern Ukraine,” and “underlined their strong support to upholding the sovereign equality of all States as well as respect for their territorial integrity.” India has toed an ambivalent line on Russia’s actions in Ukraine, including the annexation of Crimea, while Germany, which has certainly been critical of Moscow, has been concerned by saber-rattling between NATO and Russia. The long list of economic MoUs speaks to the ongoing widening of the Indo-German relationship. The German government, like many that of many western states long frustrated by India’s foreign investor unfriendly economic environment, welcomed Modi’s election victory last year. (Merkel spoke to Modi on the phone last July, on her birthday.) With MoUs on manufacturing, fast-tracking registration for German firms in India, cooperation on railways, solar energy, and agriculture, among others, it’s apparent that the bilateral relationship is broadening fast. On solar, Germany pledged to provide over 1 billion euros in financial assistance to help ongoing renewable energy efforts in India. “I admire German leadership in clean energy and commitment to combating climate change,” Modi said. The meeting between the two leaders comes shortly after India announced a plan to cut its carbon emissions ahead of the UN Paris climate talks later this year. For now, it appears that relations between India and Germany still remain primarily focused on economic issues. Indeed, Germany, as the powerhouse economy at the heart of an economically beleaguered Europe, has much to gain from close ties with India, the world’s fastest growing emerging economy now. In March, during Modi’s visit to her country, Merkel had remarked that “Trade between Germany and India can still be improved.” Despite her concerns, trade issues weren’t at the center of this visit. Indeed, the joint statement, besides an acknowledgment that both sides “renewed their determination to expand bilateral trade and investment,” mainly discusses other areas of cooperation. Modi notes a separate vision for the bilateral. Speaking on Monday, he notes that while the India-Germany “focus tends to be on economic ties … [they] “can also be strong partners in advancing a more human, peaceful, just and sustainable future for the world.” The outcomes of this visit certainly suggests that this ambition is taking shape. Expect to see India’s engagement with Germany grow during the rest of Modi’s time in office. Merkel will leave India on Tuesday, October 6, after meeting with business leaders in Bengaluru. Will the Indian prime minister's “Make in India” message resonate in Europe’s biggest industrial power?